The migration of African Americans out of the southern United States in the decades from 1900 to 1940 has few parallels in U.S. history. In terms of magnitude only the migration west following the discovery of gold in California comes to mind; in terms of notoriety, only the Dust Bowl migration out of the mid west in the 1930s. Why move? As you will discover the reasons were varied and involve factors of push as well as pull. You will use primary sources including letters, pictures, songs, and poems to explore the reasons that over two million men, women, and children left the South during this period. You will study histories of the experience created by participants to better understand the experience on both ends of the migration. And you will use GIS software to discover more about who was involved, where they came from, and where they went. 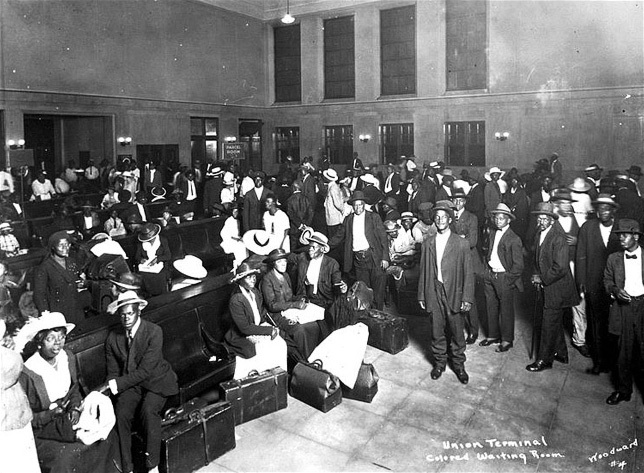 image from "Segregated waiting room at railroad depot : Jacksonville, Florida," The Florida Memory Project.